A 1965 issue of Ladies Home Journal featured this fun salt and starch clay in their special Christmas issue. 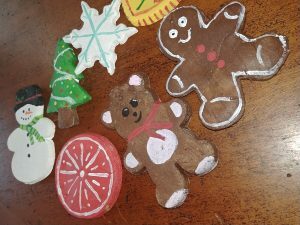 I was determined to make it, because why not really, and we now have some finished ornaments to show you and share the recipe! The recipe is pretty easy but does take one special ingredient. Don’t panic though, I was able to find it online with a quick search and even from Amazon. The clay itself is divine! 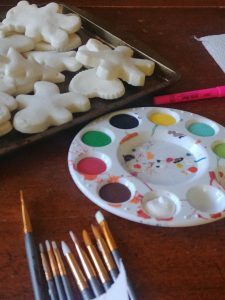 Much smoother than salt dough, and it takes paint beautifully! Ours were painted with cheap regular craft paint, and even though our paint really is thin and awful it still only took one layer for beautiful color. This blog post may contain affiliate links. If you make a purchase I may make a small comission at no cost to you. 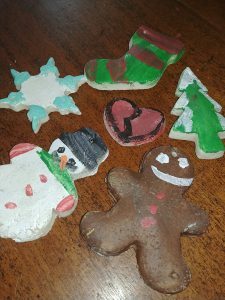 Fun Clay for Kids to make Christmas Ornaments and the like with. Mix 1/4 cup of water and the starch together. Blend until crumbly. This makes the powder less fine so it isn't just floating around and puffing in the air. Bring salt and additional water to a boil. When boiling remove from heat. Mix the starch mixture into the salt water, add the oil. Stir until stiff and well mixed. This part can be tough, it thickens up quickly. Just do your best. Mine still had visible starch chunks when I moved to the next step. When it is mixed as best you can and a bit cooler start to knead it. It will still be a bit warm. Knead for about 10 minutes until you have a good, smooth, dough. It should be pretty uniform looking and not sticky. Roll with a rolling pin to about 1/4" thick, cut with cookie cutters. Using a bamboo skewer or chopstick make a hole for hanging. Be sure to make it a little larger than you think you will need, it does shrink a little bit as it dries. Bake on an ungreased cookie sheet at a low temperature for 1 hour. 200-250 degrees. This just dries them out and makes them stiff. The original recipe said to let it dry for three days before painting, BUT I didn't notice any chance after the initial bake. So if you have time allow them to keep drying awhile, and if not you can probably just get to painting. Maybe you could make the dough one rainy/snowy day, and then save the painting for another rainy/snowy day. This recipe can easily be doubled. If you have more than two makers I advice doubling it. 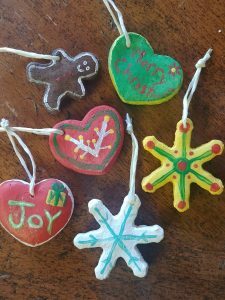 We made a double batch and got plenty of ornaments, enough to have pickings and not feel like we ran out too soon. 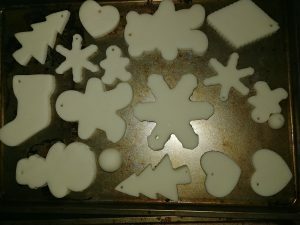 Our ornaments cut and ready to start baking. All ready for a painting party! We made quite a few ornaments and even included some in a neighborhood socking. (A random act of kindness that involves leaving a stocking full of cheer hanging on someone’s door.) I think the dough has just the faintest fresh smell to it. Not fragrant, but if you really get close I find the smell very pleasing. If you make it I’d love to hear about it! 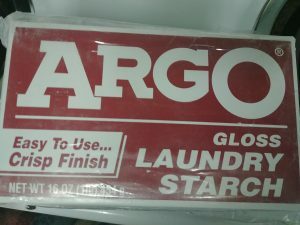 I love these little ornaments and you’ll love Argo Starch. I am the third generation to always have a box of it in the cupboard and it’s the only starch I use on my doilies. I have snowflakes that were starched over 10 years ago and they are still stiff. Good to know Pam! I know that starching used to be a much more common activity, and have heard of liquid starch but the powder was new to me. It’s certainly affordable!! I intend to always keep the starch just because I love this recipe so much. A gross improvement from the standard salt dough and the same amount of work! I saw your link to an article about Whooping Cranes. We live near (20-30 minutes) from a nature preserve that does a lot of work with them! I wonder if the liquid starch would work if you left out the liquid from the recipe. I say that because I have a jug of liquid starch from some science experiment or slime recipe or something. Very cute! I’ll have to try them! 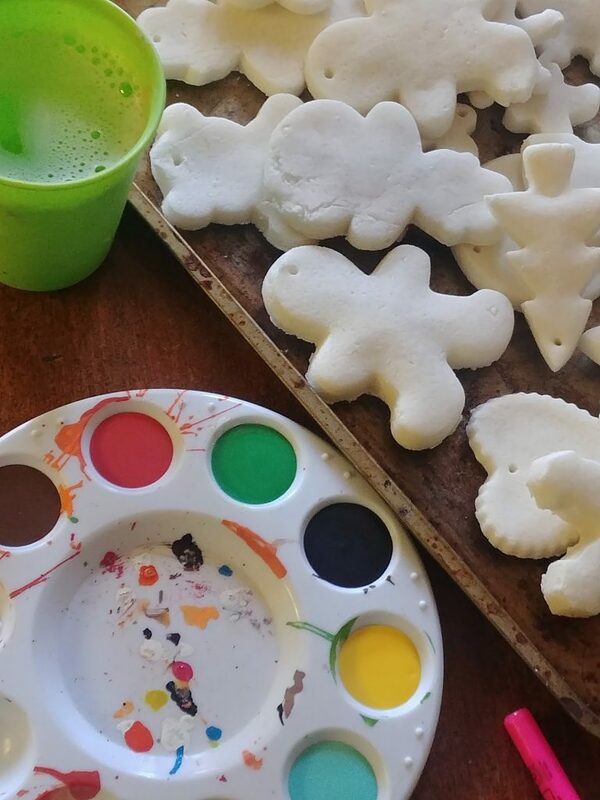 A great alternative to the salt dough and play dough, especially if you need to be gluten-fre! The box also has a clay recipe that I intend to try. 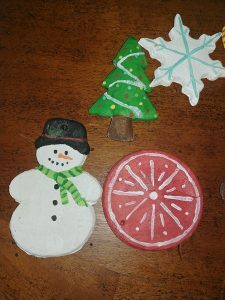 These ornaments start to get stiff pretty quickly, but the finished result is so smooth and nice compared to salt dough. I did wonder about liquid starch, but I didn’t have any of that and if I had to buy something I might as well buy what it called for. I keep meaning to pick up a jug of liquid, so many things seem to call for a tablespoon of it.